Mid-June, I had finished all of my projects and classes; grades were assigned, logged, and submitted; house was packed and I was ready to go home. 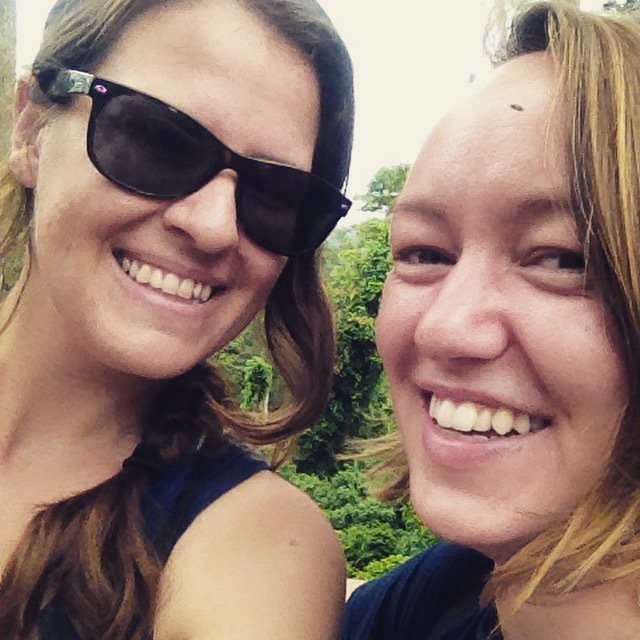 For a few days before my departure from the African continent (at least for a few months), my housemate Annie and I decided to take a brief sojourn to the Western swath of the continent: Ghana. We found a direct flight from Kigali to Accra, booked a few hotels, and jetted off for five days to experience the Gold Coast: Ghana, the first African country to win independence from their colonial overlords. With plans of more posts to come, here are a few frames of a few days spent up and down Ghana’s Atlantic coast. Cape Coast Castle, a few hours West of Accra on a coastal road, was constructed by the Swedish (begin in the seventeeth century) and British. During the British slave trading years, even after the slave trade was abolished in the colonies, slaves stayed here for 3 weeks to three months during the centuries of the Trans-Atlantic Slave Trade, forced into prison-cell dungeons with little light, air, or food: the cruel beginning of a live to be spent in slavery. President Obama and First Lady Michelle Obama visited in 2009 as Michelle has been able to trace her family history back to the region. 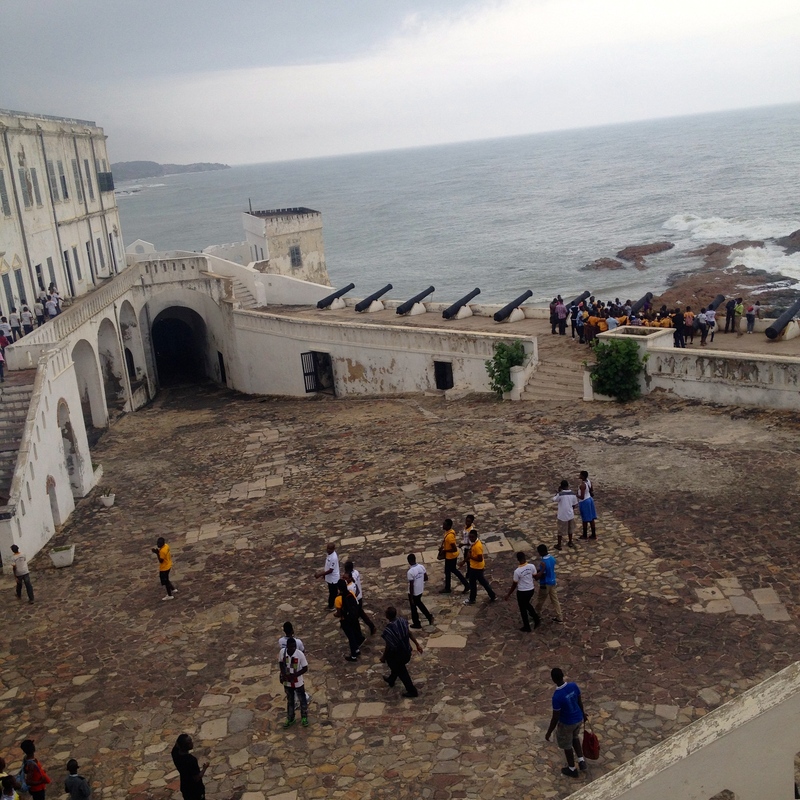 The Cape Coast Castle courtyard from above: a line of cannons to protect the fort (and it’s slave-trading interests) from competing European powers. Elmina Castle, built by the Portuguese before Columbus sailed for the new world. Originally titled Castelo de São Jorge da Mina. “Elmina,” the name of the city, is the local pronunciation of the word “el mina,” Portuguese for the mine: the Gold Coast received its name from the rich gold deposits that bloated the coffers of European powers including Portugal, Holland, Sweden, Denmark, and, of course, Great Britain. The Door of No Return: not even tall enough for me to enter without ducking my head. This opening in the stone was the last station a slave would pass before being packed onto a ship and sent to the colonies in the New World. This would be their last glimpse of their lands. The exit was made intentionally small to control the flow of slaves out of the castle and allow the slavers to count each one. 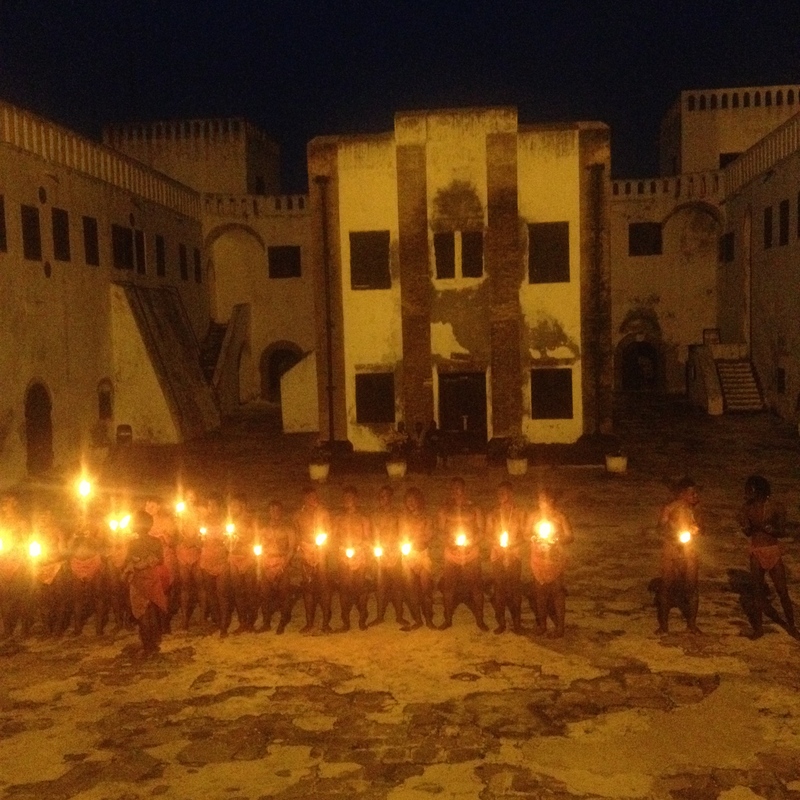 We were fortunate to be able to witness a performance art piece staged at Elmina Castle during our stay in the area. A group of volunteer artists recreated twelve hours in the life of a slave imprisoned in the castle, dressed in the scant clothes afforded to captured Africans. They spent a cold night on the stone dungeon floors without access to food, toilets, or the needed mosquito nets and bug spray that protect us from malaria and mosquito bites. Here, they line up with candles before entering the dungeon. In the dungeon, clutching the bars, the scrapping of chains on lime-covered stone. It’s as if we were transported back three hundred years: an African, dressed in rags and imprisoned against his will. Me, white and of European descent, free to observe his captivity and exploitation. It was powerful reminder to me, personally, of the privilege that I enjoy, my citizenship as an American. In Accra: colonial legacy in architecture. After the end of the slave trade and later freedom of slaves throughout the colonies, the British remained in the region, claiming the region as the Gold Coast colony. Ghana is significant as it was the first colony to gain independence from the ruling colonial power, which came for the nation in 1957. Ghana’s leader in the transition years and after independence was Kwame Nkrumah. We visited his mausoleum and museum, near the seaside in Accra. Statues of horn-blowers announce the presence of the leader. Statue of Nkrumah with the mausoleum in the background. Kente weaving: fabric that is made of strips that are handwoven and joined together. Each pattern and color choice has meaning and tells a story. This piece is found at the National Museum in Accra. Accra’s architecture is a spattering of colonial British, mid-century modern and today’s Chinese-built glass/cement monsters. Here is a gorgeous angle of the National Theatre in Accra. 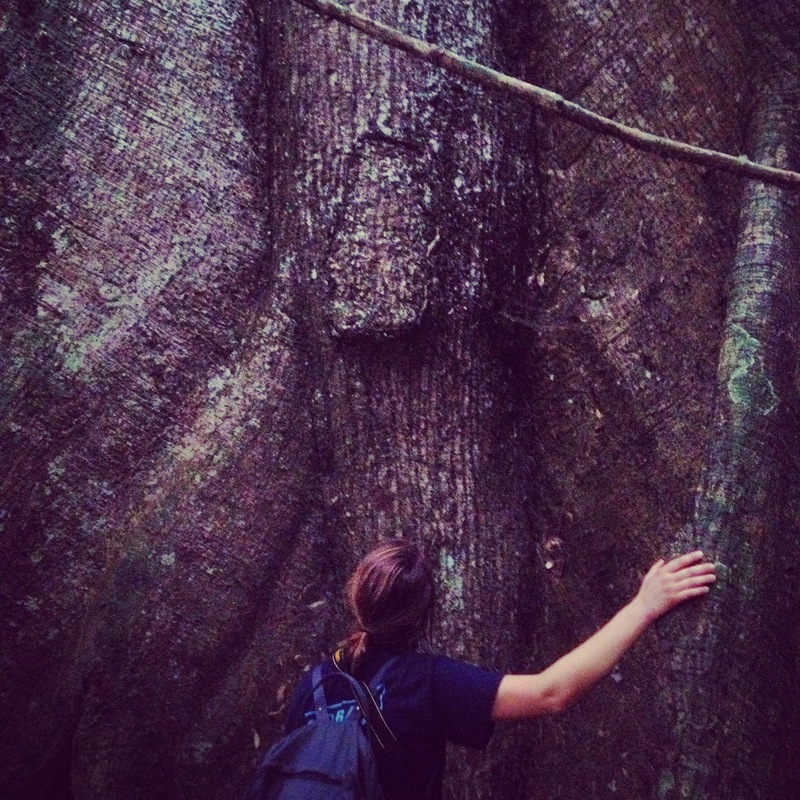 Kakum National Forrest, a few hours west from Accra: a lush jungle with a walkway that takes you through the canopy. 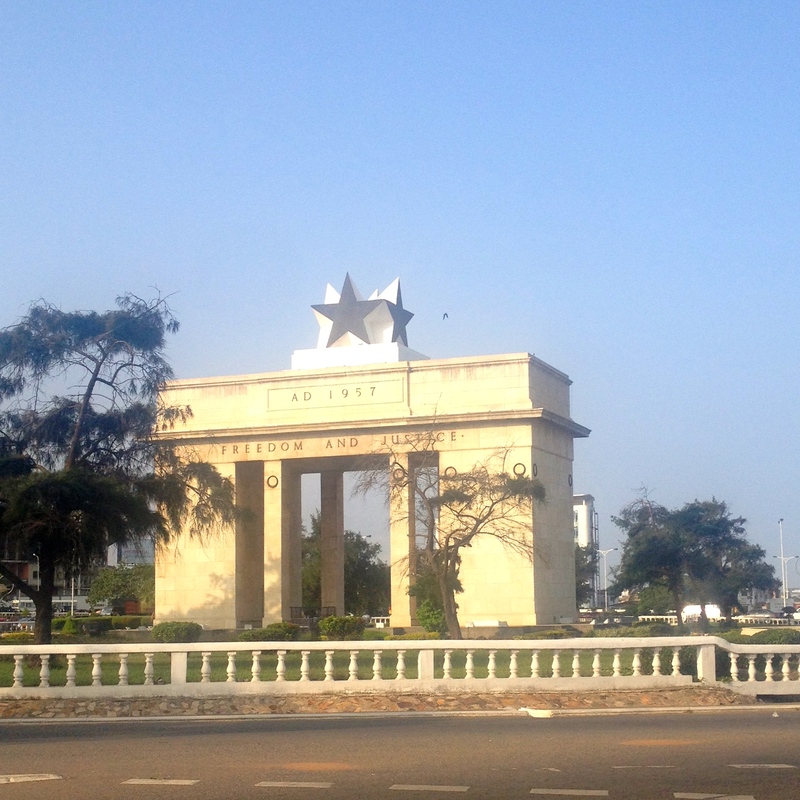 Accra Museums and Sites: We went to the National Museum (40 GH₵), Kwame Nkrumah Mausoleum and Memorial Park (10GH₵), and National Museum of Science and Technology (first two floors were free for an art exhibition). Transport: A bus from Accra (Kaneshie Bus Terminal) to Cape Coast (14-15 GH₵ each way), exclusive taxi from Cape Coast to Elmina (20 GH₵), shared taxi from Elmina to Cape Coast (3 GH₵).